Amazon Fire TV has quickly made a name for itself in the cord-cutting world. However, it can be pretty tough to find the best Amazon Fire TV apps. To help you figure out your options, we’ve compiled this list of the 100 best Amazon Fire TV apps. It’s a comprehensive, in-depth guide that covers movies, TV, sports, news, utilities and more. There are thousands of apps for watching movies on the App Store. Here are a few of our favorites. Viewster offers you a wide selection of movies, anime, and TV – all for free. Primarily, this app focuses on documentaries, horror films and anime. Popcornflix is a free Fire TV app that offers a rotating selection of over 700 different movies – with no subscription or sign-up fees required. Its catalog includes both Hollywood blockbusters and lesser-known, independent films. The Tribeca Shortlist app is free, but you’ll need a subscription to actually use it. Its catalog includes hand-picked movies chosen by Hollywood Insiders and many movies that cannot be found on any other streaming service. If you love documentaries, check out Docurama. This app offers totally free, on-demand streaming of hundreds of documentaries, supported by ads. Choices range from indie documentaries and film festival favorites to Oscar nominees. Film Movement focuses on highlighting lesser-known independent films from festivals such as Cannes, Toronto, Berlin and Sundance. With both feature-length films and short films, this free Amazon Fire TV app is a good way to find films that you have not yet discovered. Crackle is one of the leading free movie/TV streaming services out there. Their app for Amazon Fire TV is fantastic and offers a variety of films and TV shows including comedies, dramas, action flicks and Crackle Originals. The Plex app for Amazon Fire TV has an easy-to-use UI and a gorgeous design. Once you get set up, you can connect to Plex’s unofficial channels or watch your own library of media content anywhere via Plex apps. Netflix continues to impress with a wide selection of films – both licensed and original. With an ever-expanding library of original content and much more to come, Netflix is certainly at the top of the heap when it comes to movie streaming services on the Amazon Fire TV. Backlight has feature length films – and they’re all free. Its catalog contains a selection of live sports and on-demand content, plus a small selection of original programming. The only downside is that you do occasionally have to sit through ads. Movies Plus isn’t free, but it doesn’t require a subscription – so we think it’s worth the price of entry. This app specializes in forgotten classics, horror films, thrillers and mysteries. In addition, Movies Plus hosts a wide variety of web series and indie movies sourced directly from users. Shudder is built for one thing – horror! If you love horror films, Shudder is exactly what you need on your Fire TV. Focused on thrillers, suspense, and paranormal films, Shudder has an ever-expanding library of full-length films and TV. Though its price tag may be a bit high, Classic Movies is a great app for movie lovers. With unlimited, ad-free on-demand access to hundreds of films from around the world, it offers a taste of Golden Age Hollywood, Bollywood and more. Pureflix is a great choice for families looking for child-friendly entertainment. Featuring wholesome documentaries, movies, and TV programming as well as animated shows, this app has a lot to offer if you’re a parent. These are our picks for the best Amazon Fire TV apps for watching TV shows. The official AMC app is a great place to watch AMC original shows like The Walking Dead and Preacher. Older AMC originals like Breaking Bad are available, too. If you’re a comedy fan, you can’t miss the Comedy Central app on the Amazon Fire TV. With original programming like South Park as well as the latest episodes of The Daily Show and other top-rated TV series, there’s a lot to love about this app. Are you an animal lover? Animal Planet GO! offers plenty of great documentary content, reality TV shows and informative, educational content – all about animals! With a wide selection of child-friendly content available, this app is another good pick for families. FXNOW is the best place to catch up on Sons of Anarchy, Fargo, It’s Always Sunny In Philadelphia and more. Because it has both new shows and archived content, you’ll never run out of things to watch. If you subscribe to only one TV streaming service, get Hulu. With a huge variety of content from top cable channels and networks and an expanding library of Hulu Originals, we think Hulu is the king of the TV streaming world. If you’re an anime fan, FunimationNOW is a great addition to your Fire TV. With a Funimation subscription, you can enjoy ad-free anime on-demand and access the latest episodes of top anime series only hours after they air in Japan. Crunchyroll is another leading streaming service focused on both anime and live Asian drama programs. Ad-free with a subscription, Crunchyroll allows users to watch the latest anime and Asian drama series – plus it has a huge selection of archived content. If you love DIY projects, the HGTV app might strike your fancy. You can catch the latest episodes of top-rated series such as Flip Or Flop and The Property Brothers, as well as plenty of other great original content related to home improvement. PlayStation VUE is an all-new streaming service from SONY. It’s basically a live TV streaming service that can be used as an alternative to cable. The Amazon Fire TV supports Playstation VUE features such as live sports and TV, DVR and more. If you have DirecTV, you can access all of your favorite shows using the DirectTV NOW app on your Amazon Fire TV. DirectTV NOW is a clever cord-free solution for anyone with multiple TVs in the house, but only one DirecTV set-top box. Discovery GO has a lot to offer. From informative documentaries, to award-winning original series, and some of the best reality TV around, Discovery has plenty of great content, and you can view it all on this intuitive, well-designed app. HBO has been leading the world of premium television for decades – and with an HBO or HBO GO subscription, you can enjoy shows like Game of Thrones, The Sopranos, True Detective, and dozens more directly on your Amazon Fire TV on HBO NOW. SHOWTIME has an enormous selection of high-quality original programs available for streaming. Its offerings include older shows like Dexter as well as newer programs such as Shameless and Ray Donovan. SHOWTIME also offers a wide selection of on-demand movies. Tubi TV is a free, ad-supported Amazon Fire TV channel that features free premium TV shows and films. With a huge variety of categories to choose from and a rotating-selection of shows and movies changing each week, it’s a great app for TV lovers. Pluto TV features 100+ channels of live news, sports, and entertainment. Ad-supported and totally free, this app features a video-on-demand library of over 1000 movies and full TV episodes. Fawesome.tv offers a free selection of editor-curated TV shows in a wide variety of genres, including cooking, sports, comedy, education, entertainment and more. With an easy-to-use UI and plenty of content, it could be the best Amazon Fire TV app you’ve never heard of. The official Yahoo Fire TV app gives you access to a large variety of streaming content. 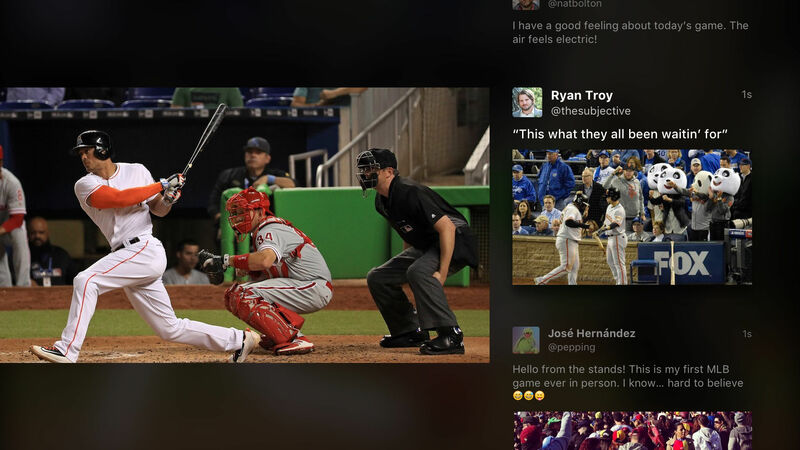 You can watch Yahoo Originals like Community, clips of the latest SNL skits, in-game highlights from the MLB, and even live concerts from around the world. Sling TV is a powerful, customizable TV service. The Sling TV Fire TV app is easy-to-use and navigate and offers a free 7-day trial. If you’re interested in picking out your own “a-la-carte” cable/network TV experience, Sling TV for the Amazon Fire TV is a perfect choice. Fox NOW gives you access to a large archive of video-on-demand content, as well as live TV streaming. Free users can access shows that are up to 5 weeks old and cable subscribers get access to the entire Fox NOW archive of content. Like its counterpart Classic Movies, Classic Cartoons offers ad-free access to hundreds of classic, hilarious cartoons. Whether you’re an old-school animation buff or you have kids, this app is a must-have. Acorn TV is dedicated to providing you with the best of British TV from BBC, SKY, and other major UK-based networks. New shows are added weekly, and there is a huge variety of content. A free 7-day trial is available via the Acorn TV Fire TV app. DISH Anywhere gives you the ability to stream DISH satellite TV on a variety of Fire TV devices. With DVR support and a large selection of on-demand content, DISH Anywhere is easy-to-use and functions well on the Fire TV, making it a good alternative to buying an additional DISH set-top box. The free Travel Channel plan allows you to watch thousands of clips on the Travel Channel Fire TV app. With a login from your television service provider, you can watch full episodes of your favorite Travel Channel programs like No Reservations with Anthony Bourdain. Smithsonian Channel gives you a variety of educational content – free of charge. With this app, you can watch a huge archive of free clips and a rotating selection of the latest Smithsonian Channel shows. FuboTV offers streaming access to a variety of sports and documentary programs from all around the world. Live channels include Univision and REVOLT. You can access a 7-day trial from within the FuboTV app. SyFy has stepped up their original programming in recent years, with critically-acclaimed programs like The Expanse and 12 Monkeys. The SyFy app provides you with access to a huge variety of recently-aired and archived television content. Cooking Channel requires a television provider subscription, but offers free users a huge selection of high-quality clips from the archives. If you love cooking and learning from expert chefs, you won’t want to miss out on this app. DIYZ is a unique Amazon Fire TV app, focused both on DIY home improvement and online shopping. You can watch on-demand tutorials for common household projects and shop for the required materials directly from this handy application. If you’ve got kids, Nick for Fire TV is a must. With a cable or satellite login, you can access thousands of archived TV episodes, as well as the most recently-aired Nick episodes. CW Seed is totally free, offering classic CW shows like Pushing Daisies, Everyone Hates Chris, and Whose Line Is It Anyway, as well as new original CW Seed programming like I Ship It. Free and easy to use, CW seed is a solid Amazon Fire app. Whether or not you have a TV subscription, the NBC app brings a lot to the table. Subscribers can access a gigantic archive of content and watch episodes the day after they air. If you don’t have cable, you can still access past episodes 8 days after they’ve aired on NBC. TBS requires a TV subscription for most of its content, which includes live sports, original comedies and more. However, you can watch select TNT shows without a subscription. MTV provides free users with a rotating selection of their most popular, recently-aired episodes, plus plenty of bonus clips and original content. With a TV login, you can access thousands of archived episodes and TV shows. Hotlist features free, ad-supported TV shows and movies. Its content is always changing, with new movies and TV shows being added regularly. 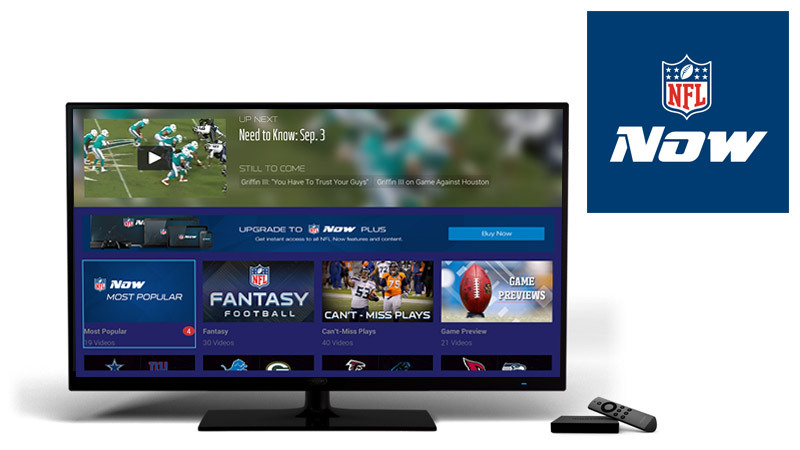 If you’re a sports fan, Amazon Fire TV offers a huge variety of useful apps to choose from. Here are our top picks. The official NBA app for FireTV features statistics, scores, schedules, standings, and recap videos from every game. NBA League Pass account holders can also watch live streams of NBA games. MLB.tv At Bat features exclusive game-day content, streaming of select games, box scores, radio broadcasts and much more, including a customizable home screen. NBC Sports features video clips, event previews and highlights from past events, as well as live events and replays from the NHL, MLB, NBA and dozens of other major sports leagues. Free users can enjoy a small selection of content, but a TV provider login is required for live TV streaming and additional features. The official NFL app is a must-have for football fans. With it you can access breaking news, highlights, statistics, and more including game replays and archived clips of past games. You’ll need to buy an NFL Game Pass subscription to gain full access to it, though. WatchESPN for Fire TV is the #1 sports resource for Amazon Fire TV. It offers you coverage of major league sports like the MLB, NFL, and NBA as well as college sports and other sports like tennis and golf. The official UFC app caters to fight fans. Pay-Per-View events can be purchased and viewed from directly within the app, making it great for cord-cutters. In addition, a large archive of past fights is available on the UFC app. MLS is totally free, providing news coverage, highlights and analysis videos for Major League Soccer. Other features include team line-ups and bios, as well as built-in Twitter feeds of in-game coverage. Looking to stay informed? Here are our picks for the best news channels on Amazon Fire TV! PBS offers totally free, informative content. Ranging in content from news coverage to informative documentaries and programming, the PBS app is reliable and easy to use. USA Today provides live video coverage and a variety of free, constantly-updated articles, pulled directly from the USA Today website. Bloomberg TV offers free, 24-hour news coverage, focusing on financial and business news. It also offers access to thousands of hours of critically-acclaimed content such as Charlie Rose. Sky News also offers a free 24-hour live news stream, covering the most important events both in the UK and internationally. Other features include top news stories and breaking headlines built into the app and weather forecasting functionality. CBS News gives you access to a 24×7 stream of top-quality coverage, with real-time updates and breaking news stories. You can also access on-demand shows like CBS Evening News, 60 Minutes, and Face The Nation. BBC News for Fire TV is a great resource if you love informative, neutral reporting. With coverage of US, UK, and international news available and a wide variety of full length articles that are updated throughout the day, this is a fantastic app for news junkies. CNN GO provides full-HD news streaming for FireTV users, as well as a variety of photo galleries, related coverage, and articles. From live TV to archived broadcasts, there’s always something to watch. Great video content isn’t just limited to TV and movies. Here, we’ll go over our top picks for online video content on the Amazon Fire TV. Zen TV offers hundreds of videos across 30+ channels that are designed to aid in meditation and mindfulness. This includes soothing video and audio, nature sounds and even guided meditation videos. The IGN Fire TV app is one of the best gaming apps out there. It gives you access to walkthroughs, game reviews, breaking news and all the information you could ever want about the gaming industry. The YouTube app for FireTV provides Fire TV users with an optimized version of the YouTube mobile site, with all of the functionality and features you would expect. You can sign in to view videos from all your favorite YouTubers and enjoy millions of hours of video content. Vimeo is like an artsy version of YouTube. Its a great place to find indie documentaries, intriguing music videos and much more. With advanced search features and an all-new Explore page, there is a lot to love about Vimeo for the Fire TV. Red Bull TV offers a 24×7 sports highlights stream, as well as thousands of hours of archived HD content, weekly live events and more. If you love motorsports and extreme sports, give this app a try. For gamers, there’s no substitute for Twitch. The Twitch for Fire TV app provides easy access to the largest online gaming community in the world. Features like chatting, subscribing and tipping are fully-functional. TED TV gives you access to over 2000+ TED Talks from the best and brightest in the fields of technology, sociology, philanthropy and more. GoPro Channel lets you view the best GoPro videos from around the world, uploaded by GoPro users. Clips include first person views of intense sports like surfing, skating, snowboarding and skydiving. Love music? Vevo is the best place to discover new and old videos from your favorite artists. The Vevo app lets you save your favorite artists and videos and provides tailored recommendations based on your tastes. Addicted to news? Are you an audiobook worm? Are you a music fanatic? If the answer to any of those questions was yes, Amazon Fire TV has an app for that! 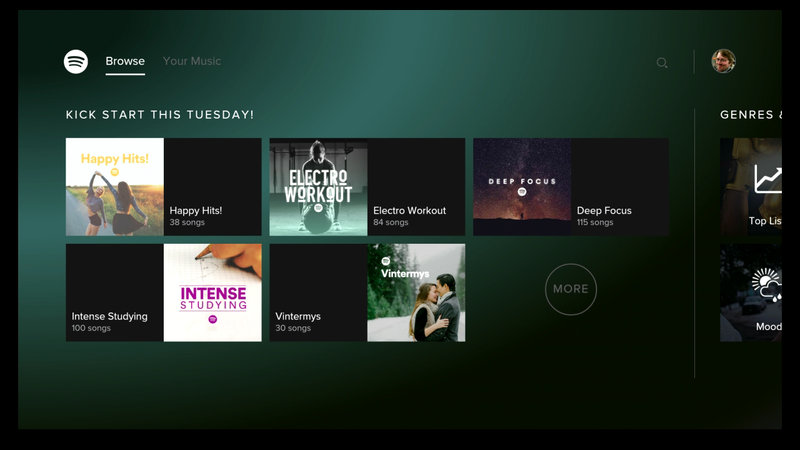 Spotify for Fire TV allows you to play your music on the big screen. You can control it using either your Fire TV Remote or Spotify Connect on your smartphone, making it easy to listen to the tunes you dig the most. TuneIn Radio is a highly underrated app for news, informative interviews, sports programming and radio drama programming. With access to 100,000 different stations, you have a literally limitless set of radio stations to listen to! Pandora boasts an advanced artist discovery algorithm and the ability to create curated, personalized radio stations. Its an excellent, free way to listen to the music you love. Audible is the #1 provider of audiobooks in the world and its Fire TV app does not disappoint. If you don’t have a Bluetooth speaker, Audible on your TV is a great way to bring your audiobooks to life in your living room or in your bedroom. SiriusXM offers an enormous selection of ad-free music channels and a variety of talk shows and sports coverage. The official SiriusXM Fire TV app lets you take SiriusXM out of your car and into your living room. If you love public radio, NPR One is a must-have for your Fire TV. You can personalize the app based on your location and preferences and listen to podcasts, news stories and radio programming from your local NPR station. For free music and internet radio, iHeartRadio can’t be beat. This app is completely free and features thousands of live radio stations across dozens of genres. From talk radio and religious radio to rap, jazz, country and top 40, iHeartRadio has it all. The Amazon Fire TV is built on Android, so there are a wide variety of utilities that can be used to modify its functionality. Here are a few of our favorites. Downloader can be used to download third-party files, media, and apps from the internet. This allows you to further customize your Amazon Fire TV, and add more functionality. AnDoc allows you to view PDFs, .DJVU documents, and a wide variety of other documents directly on your TV. This can be helpful for presentations or research projects. FireDL allows you to download files and documents onto your Fire TV and can also work as an FTP server, allowing you to transfer local files using any FTP client. Because Amazon doesn’t support Chromecast, quite a few “cast” apps have been built for the Fire TV. Video & TV Cast allows you to use your phone to cast video directly to the FireTV, mimicking the Chromecast experience. Data Manager allows you to view and modify system files and downloaded files. If you plan on modifying your Fire TV with third-party apps, you’ll need an application like Data Manager. VLC is one of the most popular media players of all time, and VLC for Fire brings its powerful functionality to Fire TV. VLC can play almost any local video/audio file, plus it supports network streaming, subtitles and multi-track audio. Tablo is a simple, lightweight app that allows you to connect an OTA antenna to your Fire TV. Signal for Fire TV allows you to monitor incoming messages and notifications directly on your Fire TV. With this app, you can set up notifications for incoming calls and emails and never miss an important message. If you have had difficulty getting a reliable signal on your Fire TV, myNetLyzer Pro may be just what you need. This application measures WiFi signal strength, signal bandwidth and strength at the location of your Fire TV. You can also analyze other connected devices and learn how to reposition your Fire TV for more reliable streaming performance. MyRadar is a free Fire TV app with an easy-to-use weather radar that can be customized to show storm warnings and weather radar for your location. IPVanish is the most reliable VPN service for Amazon Fire TV and the IPVanish app is easy to use and setup. Whether you’re looking to avoid bandwidth throttling and monitoring, or are planning to use third-party streaming apps, protect yourself with IPVanish. Interacting with your Fire TV using the physical remote can be cumbersome. Remote for Fire TV provides you with a fully-functional keyboard, music and video controls – and even a virtual mouse. This makes text entry much easier on Fire TV. Simple Clock for Fire TV is pretty self-explanatory. It’s a low-impact, minimalist clock designed to be used as a screensaver when your Fire TV is not in use. ES File Explorer File Manager allows you to view your Fire TV files, but it also supports cloud-based storage such as Dropbox, Google Drive and One Drive. This allows you to stream content and download files directly from your personal cloud storage services. PhotoGuru is a simple, easy-to-setup photo player built for Fire TV. You canuse it o download photos from the internet or set up cloud-based services such as Facebook, Google Drive, Zenfolio, Amazon Cloud Drive and Dropbox. With a customizable display interface and beautiful UI, PhotoGuru is a great way to display your favorite photos. In this category, we’ve placed all of the Amazon Fire TV apps that we liked but don’t quite fit into any of our other sections. Take a look! IrUSB is built to streamline your home theater setup by minimizing redundant remotes. With this app and an IrUSB dongle, you can add IR (infrared) input to your Amazon Fire TV, and control it with any universal remote on the market. The AccuWeather app provides a live weather radar, as well as severe weather alerts, breaking news and hyper-localized forecasts based on your street address. You can also browse forecasts worldwide. Prime Photos allows you to use Amazon Prime Photos on your TV. You can view all of the photo albums that you’ve backed up using the Amazon Prime Photos service and use Alexa to sort through photos based on location, content, and more. Facebook for Fire TV is made to help you consume video content from your Facebook feed. It gathers all of the videos shared on your feed and uploaded/live videos from friends. Twitter on FireTV lets you experience the best of Twitter in a whole new way. Customized for the big screen, Twitter on FireTV supports live sports streaming, Periscope, video playback, and timeline browsing. EarthCamTV features thousands of webcams from around the world. This app streams spectacular views and breathtaking events from dozens of countries, all at top HD quality. Amazon Shopping is not exactly groundbreaking, but if you’re looking for a way to shop conveniently from your Fire TV it’s your best bet. Popular Science is a great multimedia app. You can use it to view top-rated videos from the Popular Science magazine and learn about science and technology. No subscription required!